Young people gather to discuss ecological justice! 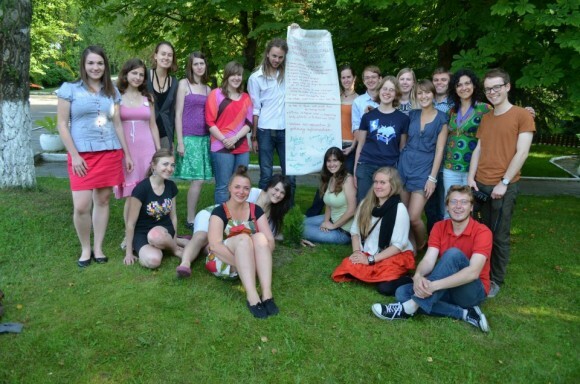 From 24th June to 1st July 2012 more than twenty young people from Europe and beyond, as well as from various denominational and national backgrounds gathered in Minsk, Belarus, for an EYCE training course “Taking steps towards an ecologically responsible society. Economic and political aspects of ecological justice.” The participants got the opportunity to further develop their knowledge of different aspects of ecological justice and acquire practical tools and skills for further promoting the ideas discussed. The training course was organized by the Ecumenical Youth Council in Europe in cooperation with volunteers in Minsk. Several guest speakers contributed to the programme of the training course with their knowledge and expertise. Ecological knowledge and practical tools were offered to the participants by using a variety of non-formal learning methods. Rev. Henrik Grape, Officer on Sustainable Development at the Church of Sweden, shared his own life experience of advocating sustainability from a religious scope/point of view. He provided the participants with a deeper understanding of the global situation through the use of data and by pointing out the main challenges sustainability as an ideal is facing. Mr. Evgeniy Lobanov, a local guest speaker from Belarusian environmental organisation “Environmental Solutions” gave a broad insight of the Belarusian situation according to the environmental issues. The participants could become aware of the reality of the situation in a country they might not know about and benefit from the practical example of experience Mr. Lobanov shared with them. The highlight of the week was the “Challenge your Lifestyle!” day, where participants and the team restrained from using electronic devices, excessive water consumption and learned some practical skills through the up-cycling workshops. The garbage collection organised as Mr. Evgeniy Lobanov’s follow up session, was the opportunity for the participants to actively contribute to improve the local environment and raise awareness among local inhabitants! The final part of the programme provided the participants with knowledge and ideas for use in their practical work through sessions on advocacy, exchange of best practices and local experiences with youth groups. Participants also brainstormed to implement the outcome of the training course in more practical terms. They came together through a series of ideas how to address the issues of ecological justice in their own contexts and inscribed them on the official training course Charter. The participants contributed actively to the process of the training course with their experiences and knowledge of the subject, and enriched the atmosphere of the event greatly with creative approaches to the activities. Finally, to mark the end of the training course a tree was planted at the venue of the training course, in the outskirts of Minsk. EYCE would like to take this opportunity and warmly thank Sergej Yushkevich and Krystsina Charniuk for their great support in organising this training course!